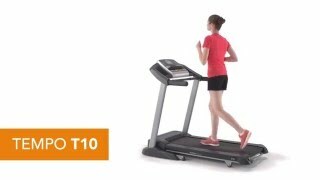 We took a look online to see what users had to say about the NordicTrack T10.0 Treadmill. Out of 20 user reviews, this treadmill scored an impressive 4.7 out of 5 stars. The large, backlit display allows you to track calories and other important workout stats. With a wide viewing angle, viewing key info such as time, speed, pulse, distance, and calories is super easy. The 2-inch speakers produce impressive sound – so whack on your favourite tunes to keep motivated! Fast and responsive, the One-Touch controls help you pick up the pace to an impressive 22 km/h (13.7 mph) in seconds. In addition, you can adjust the 12% incline just as easily. This feature is especially useful for High-Intensity Interval Training (HIIT). Speaking of which, check out this cool 20-minute HIIT treadmill workout. Oversized fans automatically adjust speed to match your workout speed. Smooth, quiet and powerful, the 3.0 continuous horsepower motor delivers unbeatable performance. Built to withstand long and gruelling workouts, the drive system cools its internal components while reducing noise. FlexSelect Cushioning provides the best of both worlds: Superior impact reduction, with cushioning for a low-impact feel, or firmer surface for a realistic road feel to mimic outdoor running. Flex Select cushioning – allows the user to change between increased cushioning and firmer, road feel. To help you save even more on your purchase, check out the offers and deals below.